There have been at least three Churches on the site of St Michael’s. The first was built beside the ruins of a Roman fort. This was most likely a wooden structure which, according to legend, was built at the instigation of the intrepid Irish missionary nun Modwenna (who died in AD 519). Again, according to legend, Modwenna built Churches echoing each of King Arthur’s forts. The second church built on the site was a Medieval stone construction (built sometime before 1547). Existing engravings of this building show gun emplacements probably put there when Cromwell commandeered the building, or later when Bonnie Prince Charlie did the same. This building was also visited and preached in by James Wishart; accompanied by his young side-kick John Knox as part of the armed guard. 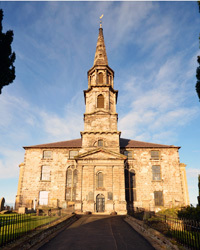 By the end of the eighteenth century the size and condition of the medieval church was causing concern to the Kirk Session. So the decision was taken to build a new church “to prevent the people from resorting to other places of worship”. The present building was completed in 1806. This was to a large extent the brainchild of the illustrious Minister of St Michael’s, Dr Alexander “Jupiter” Carlyle. It was substantially al tered to accommodate the innovative new trend in worship, a pipe organ, in 1895. This Lewis Organ was quite radical in its design at that time and of the highest quality. St Michael’s can boast some notable Ministers in its post Reformation history such as the second Minister Rev Andrew Blackhall who was an accomplished composer of music. Rev Alexander Carlyle was a pioneer of the Sunday School movement and whose autobiograpghy shed light on a very turbulent period in Scotland’s history. Rev John Beveridge was a campaigner for the renewal of worship and distiguished himself by his devotion to duty during a cholera outbreak. In 2005, St Michael’s celebrated the two hundredth anniversary of the present building. Today, St Michael’s continues to serve the Lord and His people. It strives to be the Visible Kirk, remembering the past, looking to the future, reaching out with the light of God’s love. The full history of St Michael’s is published in a Guide (5th Edition) by the Reverend Sidney Adamson. Contact us for a copy. Our newly acquired manse is a stunning family home in a quiet courtyard setting, located in the picturesque conservation village of Inveresk. The Manse is within walking distance to St Michael’s and approximately one mile from St John’s, Whitecraig. The famous Lewis organ in St Michael’s is one of only two such organs in the Lothians. Recognised across the country as a first class instrument, the organ in St Michael’s was donated in 1895 by the Kirkwood family of Haddington and stands out as a significant feature in the Church sanctuary. Despite requiring a substantial overhaul which is now underway, the organ is played each Sunday and makes a positive contribution at significant festival services like Easter, Christmas and Remembrance. On these occasions the organ responds in a spectacular manner. St Michael’s has many fine stained glass windows, not least a remarkable window by the famous Douglas Strachan. Installed in 1923, it depicts “God in Creation, Providence and Redemption” and truly sparkles on a sunny day. See our Gallery.